Factory produced small reactors must be designed with transportation in mind. 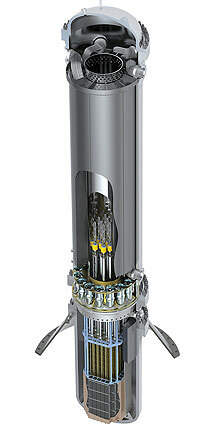 The design of the Babcock & Wilcox mPower reactor core is highly suggestive of the transportation considerations which the designers of factory manufactured reactors have in mind. In the case of the Babcock and Wilcox mPower core (illustrated to left) the core and the primary coolant loop appear designed to be shipped as a single unit. The mPower core unit appears to be intinded for shipment by rail. Width is the most significant limitation of rail transportation. A typical rail load cannot be a lot more than 9 feet wide under most circumstances. The mPower measures 75' by 15' (23m by 4.5m). That may not seem very wide but it is clear that moving the mPower core by rail is going to offer some challenges. In fact the 4.5 meeter wide package may not be the shipping unit at all. The Westinghouse SMR, a competing design measures 11.5' in diameter, and 81 feet long. The mPower steam generator is reoirtedly 3.6 metres in diameter and 22 m high. Thus the mPower steam generator unit diameter is only a few inches greater than the SMR unit diameter. Pictures of the mPower suggest that is is wider at the bottom, and the extra width can probably be accounted for by a pressure vessel slipped over the core. Thus it would appear that the mPower pressure vessel may not be shipped as a part of the core unit. How can Westinghouse slip a reactor that is almost twice as powerful as the mPower into a core package that is similar in size. The answer is that Westinghouse uses a few tricks. For example the steam generators could be placed outside the core package, and the Westinghouse core package may not include the steam generators. The SMR containment vessel has s outer diameter: 32 ft. We are thus well beyond the rail transport point with a 32' diameter pressure vessel. The Westinghouse SMR appears to be an evolutionarily development from the earlier Westinghouse IRES SMR. The question thus arrises how much labor will the factory manufactured Light Water SMR actually save in comparison to full size LWRs? The Westinghouse AP-1000 is constructed from factory built modules, and the B&W mPower may require more manufacturing labor input per MW of rated output than the AP-1000. Ditto for the Westinghouse SMR. Thus it would appear that Light Water SMR may not have a cost advantage over standard size LWRs, and although they may have a decreased construction time, they will still require a couple of years to construct. But since the AP-1000 is designed for manufacture within three years, this does not seem like a lot. We have seen in the paper, A Small Mobile Molten Salt Reactor (SM-MSR) For Underdeveloped Countries and Remote Locations, that 100 MWe MSRs can be made to be easily transported by breaking down the loads into core structure and graphite components. Core assembly could be easily acomplished in a day, during the time while the underground core chamer is being dug and lined with a prefavricated concrete liner. At that point the core can be lowered into its underground chamber. Other trucked in modules for example a reactor salt cleaning moduuel, which could be housed underground, and turbine and generator moduels. Initially, we considered transport by barge, truck, or rail. But for the IRIS reactor, because of the large size of the reactor vessel itself, it quickly became clear that we were limited to barge transport. So, we de- cided to focus strictly on barge transport. The other two groups—the liquid-metal and gas reactors—focused on truck and rail transport. Note that the 100m (328 ft) length of the plant is less than the 400 ft capacity (length) of the locks on the Mississippi/Ohio River system for barge transport. However, the 40m (144 ft) width of the plant exceeds the 110 ft width limitation for barge traffic through the Mississippi/Ohio River locks. The excess width in the plant layout arises from the width of the Westinghouse reactor building specifications. The actual width of the reactor containment and balance of plant is less than this 110ft width limitation. Therefore, barge transport is still possible if the "buildings" are redesigned or are constructed after barge arrival at the plant site. Thus barge transport is possible for 300 MWe LWRs. Since MSRs and their potential generating systems are both lighter and more compact the barge transportation of MSRs of up to 500 MWe and even greater generating capacity is a reasonable possibility. It may not be desirable to transport complete MSR generating units by barge if the reactor core is to be located underground. The underground core component would be lowered into place and then connected to above ground components. Still if the reactor arrived onsite with in only two barge carried component loads, the actual final assembly could be performed in a few weeks at most. Considering the potential barge accesible reactor locations on the Mississippi River system, the Great Lakes, and the North American Atlantic, Gulf of Mexico and Pacific coats, a factory intended to produce barge transportable reactors should not suffer from transportation problems for its products. I believe you make a good point when talking about the modular nature of a plant like the AP1000. Both the AP1000 and the small modular reactor designs use modules built in factories. In either case the advantage of factory built modules is only realized if the factory can be kept busy building modules for many plants. But do we need to build lots of new large nuclear plants? My answer is definitely, "Yes". In order to replace coal electric generation and most natural gas electric generation we need to learn how to build the equivalent of one AP1000 per month for about 20 years in the United States. At this rate several module factories could compete for the business. At this rate the construction time should actually approach the 36 months predicted by the AP1000 engineers. The cost of the AP1000 would be reduced by both module construction competition and by reduced construction time interest expense. I don't see how this would ever happen politically but it is a technical available wedge to reduce CO2 pollution of the atmosphere.